In small towns, your reputation is everything. You have to keep yourself and your home as beautiful as possible. This includes your yard and trees, which can be some of the hardest things to keep under control. For businesses like Staunton Tree Service, that means that you need to provide quality services. For us, tree care is something that you need to take integrity in, especially because you are working with the public. Everything we provide is top quality, from our workers and equipment to the insurances we keep. We offer the following services, as well as many others. Give us a call today to schedule an appointment or get a free estimate. Use the form below to request a free estimate on your tree service needs in Middlebrook, VA.
To get a tree removed in Middlebrook, all you have to do is give us a call, and we will take care of the rest. 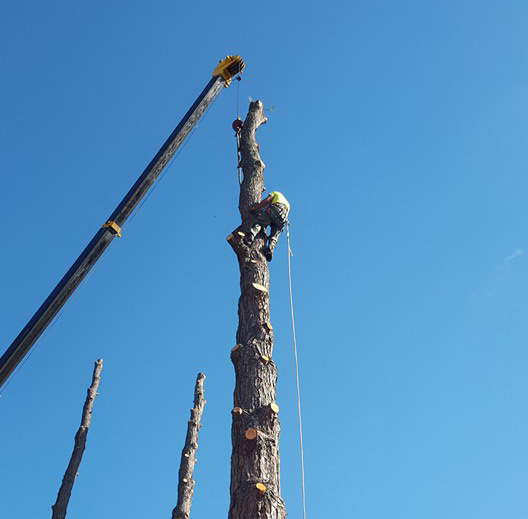 Bringing down a tree can be quite complicated, which is why you should always call on professionals to do the work for you. First, we will inspect your tree to see if there are any strange situations. Then, we will start to plan bringing the tree down. These plans will include the equipment we have to use and will even set a timeline. From there, we safely and efficiently bring the tree down and clean up after ourselves. Tree trimming is another thing you should give us a call for and not take into your own hands. Trimming and pruning isn’t as simple as you may think, and can take a lot of skill and precision to get it just right. If you do have all of that, then your pruning and trimming can pay off with better shape, more fruit, and just a more beautiful tree or shrub. However, if you do it incorrectly, your tree or shrub could be ready to join the compost pile. After removing a tree from your property, a little tiny bit of it stays with you. However, that little bit can be more than a little annoying. Leftover stumps carry diseases, infestations, and many other problems. They are also really ugly. Don’t let the stump get down the rest of your yard – get it removed. With the equipment and professionals at Staunton Tree Service, stump removal is quick and easy. Trees, when healthy, are a great asset to your yard and can last for a long time. However, if they aren’t healthy, they can have quick lives and even kill the rest of the plants in your yard. Staunton Tree Service acts like a doctor for your trees, ensuring that everything is growing properly and is entirely healthy. If something is wrong, we can also work to fix that problem. This process is one to help save you money, not cost you a lot. Many of the problems that we find will only escalate in severity and cost more and more money. Call us today to ensure that doesn’t happen. For home and business owners in Middlebrook, storms are a four letter word. They can absolutely destroy your property, ripping up trees, knocking down branches, and irreparably messing up your trees. After that happens, the cleanup can be even worse. At Staunton Tree Service, we have the skills, equipment, and insurances needed to help you clean up quickly and efficiently – while you can watch from your window. Middlebrook might be on the smaller side, but that doesn’t mean that they don’t need big time quality from their tree service companies. At Staunton, we promise to give you the very best, no matter what you need done. If you don’t see the service that you need listed above, give us a call and we can work with you.